The STEEMHOUSE Token Crowdfund has begun! Help us fund the world's first 'blockchain-centric' makerspace, powered by Steem! 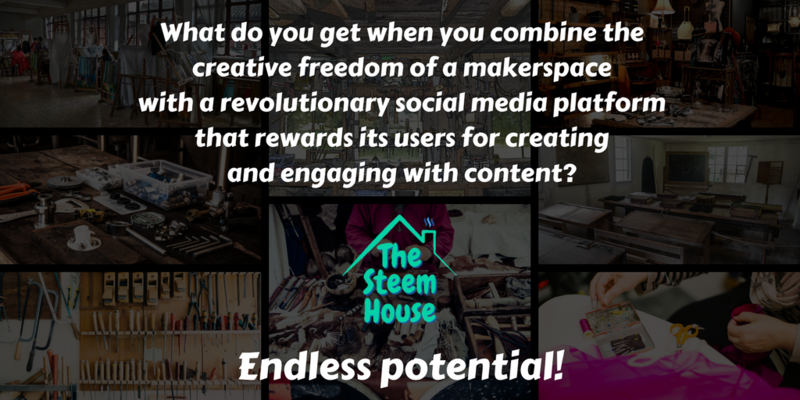 The Steem House will be a physical business that utilizes Blockchain technology to empower creatives of all kinds to make anything they can dream up, while sharing it with the entire world, and potentially earning a living doing something they truly love. We will bring a multitude of new creatives to the Steem Blockchain, each with their own skills, talents, and ambitions. We will foster their growth within the community, giving them a platform on which their content can thrive. By encouraging creative and talented people to put forth their best effort, we believe we can bring real change to a number of lives, both in our local community, and across the globe, all thanks to the opportunities offered by the Blockchain. To create that change, we plan to open the world's first 'blockchain-centric' makerspace. 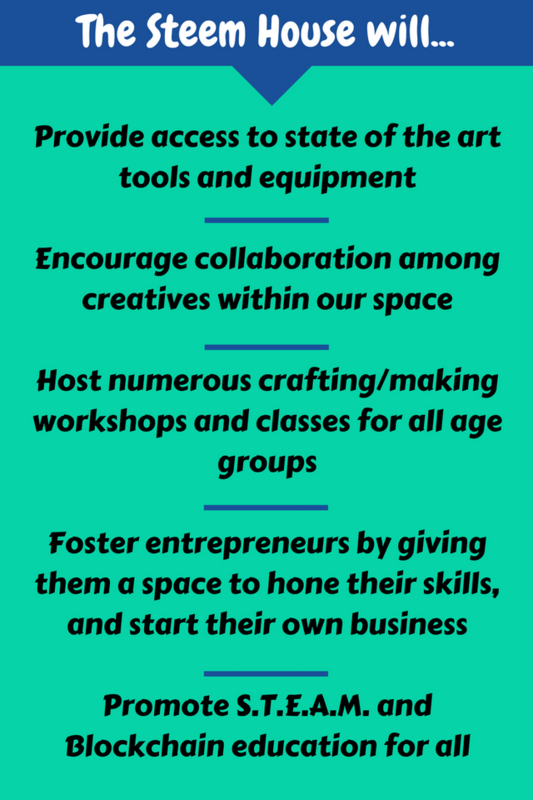 Our space will house tools, machines, software, and supplies, and by becoming a monthly member, or purchasing a day pass, people can gain access to any and all of those resources. Members will be instructed on how to use the various equipment within our space, and the entire operation will be overseen by trained facilitators. Having a public place designed for collaboration can be a never ending source of inspiration, and our space will encourage people to share their ideas, and make something great together! We will host numerous hands-on classes and workshops for creatives of all ages, and help those in our local community hone their skills and talents, or development new ideas and hobbies! The Steem House will also be a small business incubator, fostering entrepreneurs as they take on the arduous task of building the future. We will incorporate STEEM, and Blockchain as a whole, at every turn, educating our members on how to leverage this revolutionary technology. 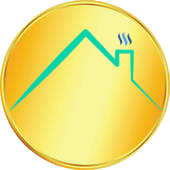 STEEMHOUSE tokens are a user-issued asset created on the Bitshares platform for the purpose of raising funds to cover the costs of renting a physical space, including rent, utilities, internet, insurance, and any other predictable and recurring operating expenses. They will evolve into a means of trade for the various services and products our space provides to the public. Within our physical space, holders will be able to use these tokens to cover any costs associated with The Steem House. Be it monthly membership fees, workshop or class admission, project supplies, or anything else we may charge for, if someone has enough STEEMHOUSE tokens, we're square. Of course, we will also accept Steem, SBD, and USD for payments. We will be creating a 'Maker Mall', full of the things our creatives make within our space, and want to sell. Token holders the world around will be able to use these tokens, as well as Steem, SBD, or USD, to purchase anything in that online store. Discounts will always be offered on any purchases made with these tokens. That discount will likely vary from time to time, but we will always favor our beloved STEEMHOUSE. There will only ever be total maximum supply of 1 million STEEMHOUSE tokens. Half of them will be sold, a quarter of them will be held by ownership, and the remaining tokens will be used to market our business and reward our earliest supporters and our community management team. Our [Dream Team] will share a 1% stake. This amounts to 10,000 STEEMHOUSE, and each member will receive a portion of that total based on their initial investment. This number works out to 5 STEEMHOUSE for every STEEM or SBD they put into the fund. @Platforms will also receive a 1% stake. We have partnered with @platforms, who have not only advised us on many points, but will also be helping with our marketing efforts. 100,000 tokens in total will be issued as rewards for various bounty events and contests. These bounty tokens will be issued in batches alongside tokens that are being sold. More information about the Bounty Program below. Tokens will be sold in batches, at a steadily increasing price, until all 500,000 have been sold. Read below for full Token Sale details. 25% of the tokens will be held in reserve as an "owner's stake"
We will hold 250,000 of the tokens for future fundraising needs, such as large upgrades, and the purchase a permanent residence. We will use the remaining 130,000 tokens to spread the word throughout our city about this endeavor. This should serve to get people in the door, possibly paying for their initial membership and material fees. Getting people in the door early on will be crucial to our lasting success. Stage 1 of our token sale will fully cover the rent and utilities of our first year and beyond. Eliminating the largest overhead expenses will be an important part of our success. Even if we start with just a few pieces of equipment, being able to keep the space open, and the lights on, allows us to generate revenue with the space, scaling the business as funds become available. With the rent and utility bills covered, the next batch of coins will be used to fill our makerspace with all the various tools, machines, equipment, software, and supplies needed to give the creatives in our community the largest number of options possible when choosing how to express themselves, or what they're able to create in our space. This will be our "expansion" stage. With the initial space paid for and fitted, we will begin expanding our space. If we end up in the old school building we have talked so much about, this would be a matter of simply signing a lease on the nearly equally large space directly across the hallway from where we intend to start. Our final stage will be all about community. With our makerspace up and running, we will be ready to begin our goal of ensuring every person in our humble city has heard of the Steem Blockchain, and the amazing things that can be done within The Steem House. A larger scale local marketing campaign will take place, and a portion of these funds will enable us to conduct the first "beautification projects" within our local community. Our Token Sale will be conducted via the Bitshares platform, in exchange for a number of coins and tokens, including STEEM/SBD. Stage 1 (the first 150,000 tokens) is already available in the market. 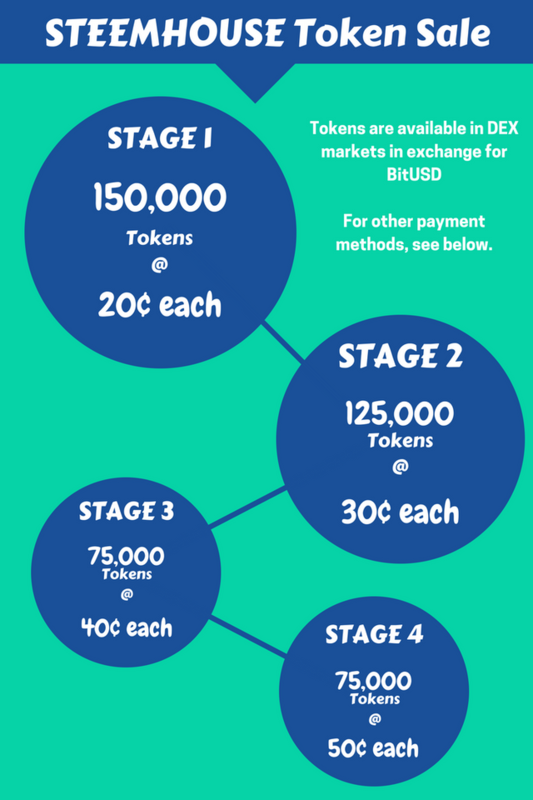 When they are sold, Stage 2 will begin, and the token price will increase to 30¢ USD each. The pricing on open orders will be updated every 72 hours to account for cryptocurrency volatility. Click any link below to be taken to the Bitshares market for that trading pair. Would you like to purchase tokens with another cryptocurrency? Get in touch with us! We can be contacted day and night, and can't wait to hear what you think of our project! We have opened numerous channels of communication in an effort to bring our project to as many people as possible. Feel free to email us at thesteemhouse@gmail.com with any questions or comments, suggestions, alternative payment methods, or anything else that comes to mind! As stated above, the completion of just Stage 1 of our token sale will see the grand opening of our makerspace. We're hoping this token sale is successful enough that we can be opening within the next month, and can't wait to show the Steem Blockchain the sort of creativity we have up our sleeves. If we all come together to make this happen, a project like this could give Steem worldwide attention, and be seen as a source of inspiration and a means of bettering one's self, and those around them. We thank you for your time, and humbly request your support for our real world Steem project! 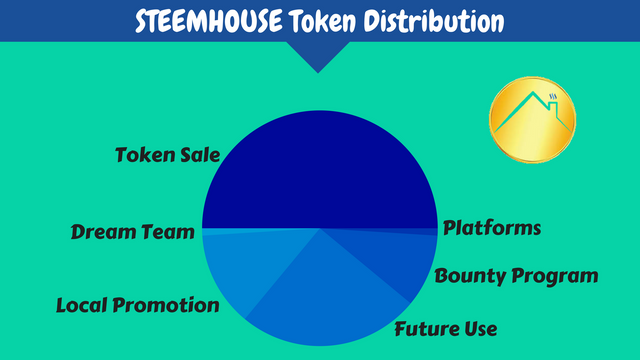 As the first part of our Bounty Program, anyone who Resteems this post will be entered to win 200 STEEMHOUSE tokens! There will be two drawings when this post pays out! Read more about our Bounty Program, in which we're giving away $27,000 worth of rewards! I'll be promoting this post tonight at the Whaleshares live post promotion show tonight, and have been chosen to co-host this week! In celebration, for the entire weekend, there will be an extra batch of STEEMHOUSE available at a 50% Discount when exchanging for Whaleshares!! Looking forward to getting more involved. Been super busy lately, but I'm still active here, still reading a lot. Just haven't been posting. Very good useful information. I, too, want to pouchavstvovat. Thank you! Thank you for the info. This sounds like a good project..
We're working hard day and night to open our physical location. With a successful first round of funding, we could be open within a few weeks! Good luck with this. I should point out that we already have a project called Steemhouse Publishing with the relevant documents filed. It's been brought to my attention, though I'm pretty sure there's no conflict. We're registered as The Steem House LLC in the state of Kentucky. We'll be sure to mention in the future that we are not to be confused with SteemHouse Publishing. The excitement is building! It's going to be like CreativeLive but on the blockchain. Very exciting! Good lukc with your project! Awesome. Also, Promote S.T.E.E.M ? unless S.T.E.A.M is a thing. Sounds like a great project, how will you keep the price of the tokens where you want it? Won't they fluctuate on the open market? They certainly will, and if people "undercut" the token sale in later phases, that's just another reason why they'd buy them now. Our first phase will fund the startup of the space, and we will be able to build a profitable business that doesn't require the sale of tokens to sustain itself. When is the Logo and Tshirt contest? please reply.